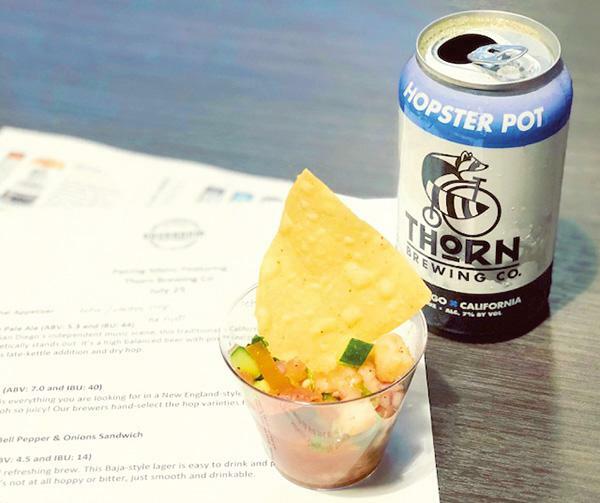 (l to r) Shrimp ceviche will be offered with Thorn Brewing’s “Hopster Pot” IPA. 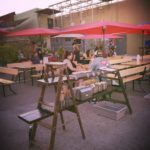 Uptown businesses Barons Market North Park and Thorn Brewing invite the public to “Backroom Beer Pairing” on Wednesday, July 25. 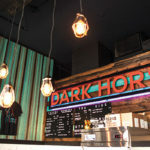 The stockroom-turned-speakeasy event pairs Thorn’s original brews with simple dishes made at demo stations at Barons Market. Barons, a grocery store with seven San Diego locations, has called the North Park neighborhood home since December 2016. 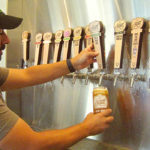 Rachel Shemirani, Barons Market vice president of marketing, explained that the event — which originated in Point Loma with Mother Earth Brewing in 2013 — was inspired by San Diego’s unique craft beer industry. So far, the series has raised more than $30,000 for local charities, such as Feeding San Diego. 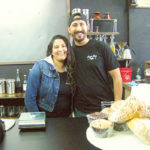 This is not the first time Barons Market has teamed up with Thorn, one of North Park’s self-described “first neighborhood breweries” located at 3176 Thorn St. and surrounded by residential houses. The market has carried beer from the locally-owned brewery “pretty much from the first day we began canning it,” according to Tom Kiely, adding that Thorn is celebrating its one-year anniversary of canning its beer this month. Keily, who handles sales, distribution and coordinates the brew schedule for Thorn Brewing, worked directly with the team at Barons Market to decide the beer and food pairings. For July’s event, there will be four Thorn brews on the menu — a pale ale, lager and two India Pale Ales (IPAs) — paired with food crafted with ingredients from Baron’s store. “Rock the Pale Ale,” a California-style pine and citrus pale ale, will be matched with spicy Thai chicken lettuce wraps; the Baja lager, “Barrio Lager,” served with sausage, pepper and onion rolls. For the IPAs, Hopster Pot, a tropical New England-style brew, will be offered with shrimp ceviche; San Diego style “Relay IPA” — infused with citrus, mango, grapefruit and pine — paired with carrot cheesecake. Kiely expressed his appreciation for Barons during the collaboration process. “It was the least corporate office I had ever been in. 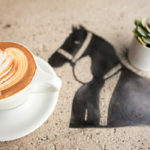 Everyone [at the table] was allowed to have an opinion and share it,” he said, noting the market’s inviting atmosphere aligns with Thorn’s philosophy. The casual neighborhood event is open to all members of the community ages 21 and up. Tickets are $15 and refundable up to one day before the event; all proceeds are donated to charity. For more information, visit bit.ly/ThornBarons. —Sara Butler is the editor of Uptown News. Reach her at sara@sdcnn.com.